Watch Parker Nirenstein founder of Vehicle Virgins, a popular Youtube channel that shows exotic luxury cars shoot at Armormax glass inside a bulletproof Rezvani Tank. Parker an engineering student from the University of Michigan, knows the extreme life all too well. From his other videos, you can see he loves giving rides in anything from a Lamborghini to a Tesla Model 3. He has been an Uber driver for would-be-lucky passengers who just happen to schedule a ride. The Youtube channel started out as advice for first-time car buyers. Parker would have friends that would come up to him and ask what they could get for $3,500. From that initial start, Parker and Vehicle Virgins has grown from fun reviews to being a big-time car reviewer that has sway with a lot of viewers. From his unbiased fun dialogue, Parker has carved out a name for himself in the congested world of car enthusiast (see his other popular videos here and here). This week Vehicle Virgins was able to stop by Rezvani Motors to see what their latest armored Tank could handle. Equipped with the latest Armormax technology Vehicle Virgins shot the car over 60 times with a variety of rifles to high-powered rifles like an AR-15. The bulletproof glass passed the certification with flying colors. The armored Rezvani tank can take on bombs and bullets as trains do. And in case you are wondering, it doesn’t lack any strength, especially under the hood. After all, the armored Rezvani tank has an option Hellcat V8 engine that is able to deliver 707 of horsepower. Clearly inspired on military tanks, the armored Rezvani tank is a softer version that you can drive. 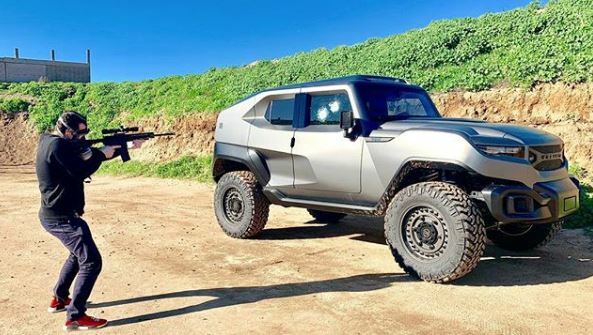 One of the things that are really interesting about the armored Rezvani tank is that it combines a lot of features that weren’t available to common individuals but who have the creativity to ask and work with Armormax to include such additions. As seen in the video these include such features as a smoke screen, reinforced suspension, a firewall, thermal night vision, siren system, strobe lights, level 7 ballistics protection, B6+ rated glass armor, and even bomb protection. The technology behind the armored glass is that it is layered and pressed together. While the glass is able to curve and keeps its’ original appearance it is anything but original. The Armormax glass ranges anywhere from ½ inch in thickness to over 3 inches depending on the desired level of protection and what a potential threat could be. The idea in bulletproofing is to stop any would attackers and provide the passengers with more “peace of mind” then they might otherwise receive in a “un” armored vehicle. Armormax has worked with other Youtubers from Jerry Rig Everything to the Waterjet Channel to What’s Inside showing anything from how their runflats work to selling bulletproof armored backpack inserts. If you are interested in having these products for yourself please call us today at 801-393-1075.